THE NEW skywalk MESCAL5 – Simple. learning. flying. Our new glider for training and pleasure flying in thermals. For many years the MESCAL4 has been the glider by which others are measured. The new MESCAL5 makes it even easier for student pilots to experience the third dimension while leaving a smile on the faces of experienced pilots. Skywalk has improved many small details and added just as many new features. The design concept uses a moderate aspect ratio of 4.8. A slight increase in the cell count, a modest shark nose and 3D shaping ensure a particularly aerodynamic upper surface. 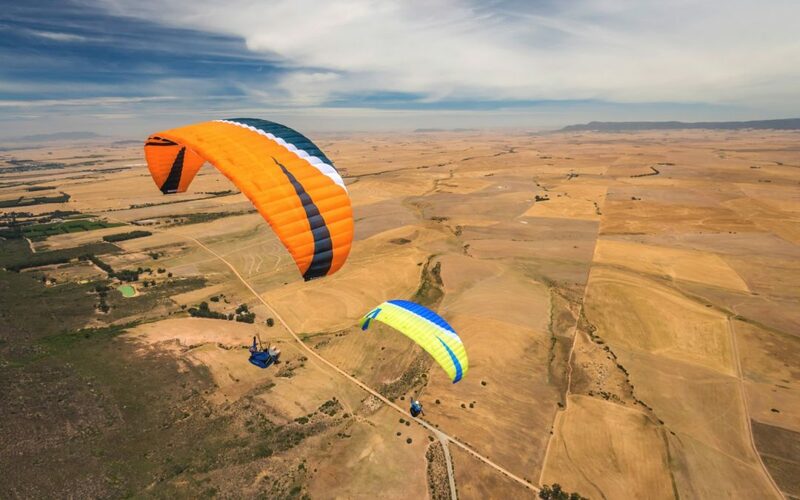 Combined with its fine-tuned handling, these new features make the MESCAL5 easier to fly and greatly improve its performance. The new MESCAL5 gives student pilots and beginners an immediate feeling of confidence in the air that helps them progress faster. Experienced pilots can enjoy an afternoon over the summit of their local mountain. The MESCAL5 is available immediately in sizes S, M, L (XS & XL following soon) and four color combinations! More information about the MESCAL5 here.